If you are a buyer searching for a property and want experienced Real Estate Agents who has 13 years combined experience, they are the agents for you. They will walk you through the buying process and keep you updated along the way. Their services are free to you as the buyer, because the truth is, the seller pays the commission. If you are a seller, Vicki and Craig will provide a free Comparable Market Analysis (CMA) to get the best possible price in today’s market. They will stay in close communication with you through closing date and beyond. They are members of the National Association of Realtors, the North Texas Real Estate Information System (MLS), Collin County Association of Realtors, and the Chamber of Commerce. 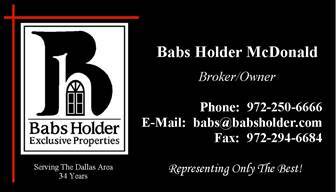 A Premier Service provider in Residential Resale, Farm and Ranch, and Unimproved land.